Ebac AD850E industrial and home dehumidifiers for commercial or large home dehumidification helps prevent water damage and control odors, mildew, mold, allergies and asthma. Dehumidifiers ratings, reviews and comparisons. Reports by consumer experts. Covers up to 1,700 sq. ft. and removes 87 pints of moisture per day. The Ebac AD850E dehumidifier is designed specifically for a wide range of applications and helps control humidity levels in areas up to 1,700 square feet. This quiet, energy efficient unit can remove large amounts of moisture in residential or commercial areas down to 41°F. Features a digital display, internal adjustable humidistat and 2 washable air filters for odor control. 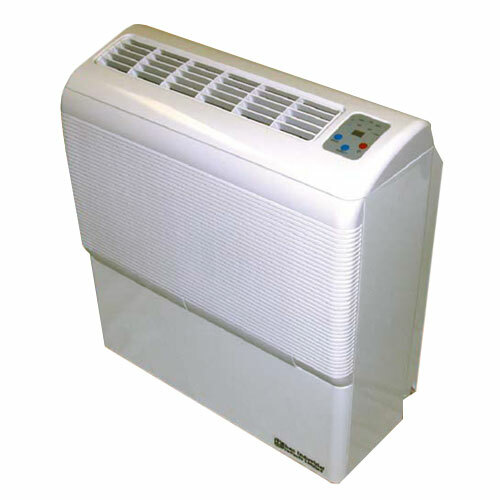 Its attractive design allows this rugged dehumidifier to be placed in public spaces. This reliable dehumidifier can be placed in indoor swimming pool/spa areas, locker or laundry rooms, or industrial environments where moisture control is required. Has a need for stylish, commercial grade dehumidifiers for an area up to 1700 sq. ft. in either moderately damp to extremely wet areas. Needs powerful dehumidification up to 87 pints of water removal per day. Prefers an energy efficient dehumidifier - with a low power draw. Needs to remove unwanted moisture within an indoor pool or spa area. Wants a dehumidifier that will remove moisture which may cause corrosion and structural damage within an indoor pool facility, aerobic room, workout area, or locker and laundry rooms. Wants attractive styling - suitable for a large publish spaces such as homes, schools, museums, restaurants, spas, gyms - or computer rooms, animal enclosures, cellars. Wants a dehumidifier with an internal adjustable humidistat. Would like a dehumidifier with a built-in internal condensate pump for automatic water removal. The effective answer to excessive humidity is a dehumidifier. Rate at 50 decibels, the AD850E is quiet enough to have in your home, yet strong to combat adverse moisture problems. The AD850E is a high capacity dehumidifier made to operate at high efficiencies by removing moisture from the air through the refrigeration process. The fan draws the moist air through the cold evaporator coil, which cools the air below its dew point. Moisture forms on the evaporator coil and is collected in the condensate tray, which is equipped with an internal condensate pump for easy removal of collected moisture. The cooled air then passes through the hot condenser coil where it is reheated using the same energy removed during the cooling phase, plus the additional heat generated by the compressor. The air is, therefore, discharged from the AD850E at a slightly higher temperature with a lower absolute humidity than that which entered. Continuous circulation of air through the AD850E gradually reduces the relative humidity within the area. Because the AD850E is equipped with an internal humidistat, it automatically switches on and off to save energy and expense by maintaining the desired level of humidity with intermittent operation. We recommend this dehumidifier for anyone who wants an attractive, quiet dehumidifier to remove moisture and protect important equipment, furniture, archives, exhibits, and books in humid and damp public places. We also recommend it for indoor swimming pools and spas. Attractive exterior: this dehumidifier is one of our most attractive looking units for public spaces. Washable air filters: 2 included with dehumidifier for dust and odor control. Low noise level - cross flow blower for quiet operation- sound similar to a quiet conversation (in between a whisper and a normal conversation level). Low operating temperature: Ebac AD850E dehumidifiers run down to 41°F, which is an added bonus for cold conditions. High quality construction: all of the essential wiring is tightly sealed inside the cabinet to protect them from the moisture and chemicals. Flexible positioning: the fact that these dehumidifiers can be wall mounted is a big plus, to keep them out of the way for space saving reasons. Energy efficient: only draws about 3.5 amps/hr when dehumidifiers are running. Multiple fan speeds: 3 fan speeds allow for energy savings when only a certain amount of dehumidification is needed. Built in condensate pump with supplied drainage hose makes re-locating the moisture that is removed very easy. Internal adjustable humidistat allows the selection of the desired humidity so it will run until it is reached and resume dehumidifying when it goes back up. The units are not wheel mounted and do not have carry handles. Expensive, but for good reason, as these units are durable, powerful, attractive, and include an internal pump. Being used to Ebac's rugged, industrial looking design we were almost fooled when we first looked at the AD850E's attractive, streamlined, modern design. Upon further scrutiny we realized this is a serious dehumidifier that can remove as much as 20 gallons of moisture from the air in extreme conditions. As you take a closer look you discover it has washable air filters, built in pump, an internal adjustable humidistat, automatic defrost, and the same sturdy construction as the other Ebac models possess. About the only thing we could find fault with was that there are no casters or carry handles so it is not the easiest dehumidifier to transport or re-locate. Also, this model is a bit pricey but you get a lot for the money when you realize it can even be used in a room with an indoor swimming pool and/or spa. This is possible due to the design of the wiring which is protected from the moisture and the chemicals by being housed separately in its own compartment. The bottom line is that the AD850E provides the moisture removal power of a heavy duty industrial dehumidifier without looking like one. Sizing up the proper equipment for your needs has many variables and we recommend using our guidance. To assist you in choosing the right dehumidifier for your particular situation please call one of our product specialists at (888) 236-7231. This is a free, no obligation consultation. In what city and state is the room located? What are the dimensions of your poolroom (length times the width times the height of the ceiling)? What is the present relative humidity in the room? What is the desired relative humidity to be achieved? What is the average air temperature in the room? Besides a pool, is there a spa/hot tub in the room? If there is a spa, what is the temperature of the water?